Last month, we only had around 15% of savings. This was the worst problem in August. It was mostly due to the fact that we got married and that I had to take leave without pay. Fortunately, this month, there was nothing so expensive. In September 2018, our savings rate was 32.3%! This is not bad at all considering the number of expenses that we had this month. Our goal is to reach 50% at some point on average. But we are not there yet. The biggest expense of September 2018 is about plane tickets. We bought plane tickets to go back to China in February for Chinese New year. It cost us almost 1300 CHF. This is not so expensive for tickets to China. But it makes a big hole in our budget. And we also purchased tickets to Brussels for November. We are going to visit one of my family members. This is less expensive but still about 350 CHF. Since I was about 10 days in the U.S., it saved us some money for food. But nothing really different on that budget. I did some shopping there that added to our expenses this month. Last month, Mrs. The Poor Swiss started to learn to drive again. 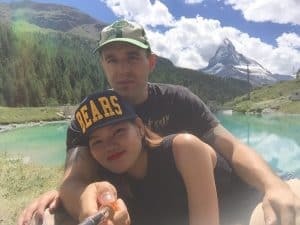 She wants to convert her Chinese driving license to a Swiss driving license. Unfortunately, she had a small accident last month. And this month, we had to pay for the repair. It makes another big hole in the budget with 800 CHF of repair. Now, I am glad I kept full coverage insurance on my car. Otherwise, we would have to pay 2000 CHF more for the repairs. There was also some small earnings this month. But nothing enough to weigh against the big expenses. I received a dividend of 64 CHF. Also, I managed to sell two more things, for about 45 CHF. In October, I will need to put more things to sell again. I still have quite a few things to sell. But the most interesting things to sell have already been sold. Our vegetable garden is still giving us some nice vegetables. We had a few more salads, zucchini and eggplants this month. And the apple tree that is next to our house has given us a lot of apples. Mrs. 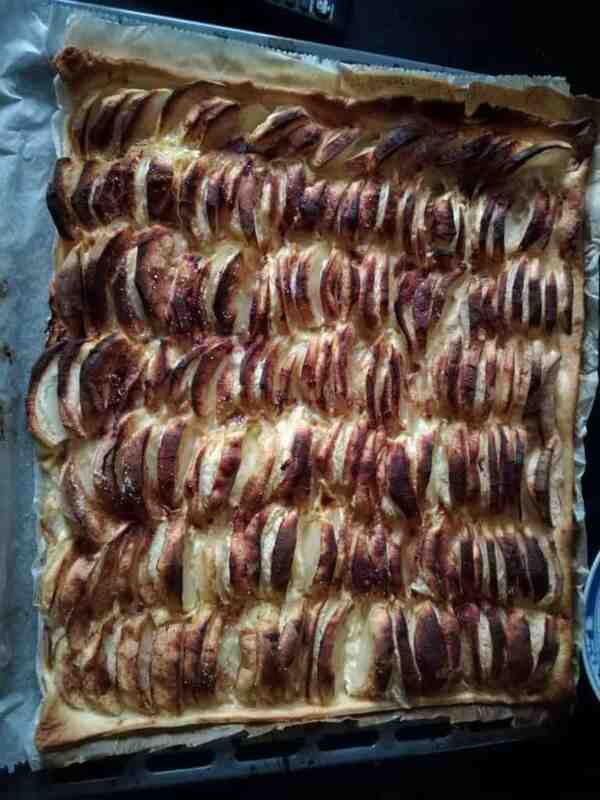 The Poor Swiss is very happy about that :) We did a nice apple pie and she did a lot of apple jam. 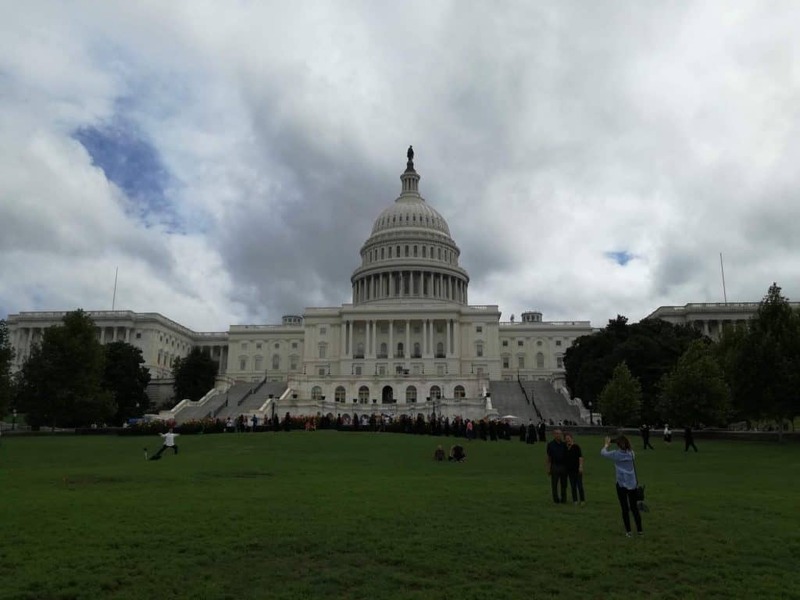 As I said, I went to the United States in September. I was there for ten days. It was the occasion for me to meet a lot of my colleagues that work in the U.S. From a work point of view, it was a really good trip. Since almost the expenses have been covered by Pied Piper, it was a frugal trip. 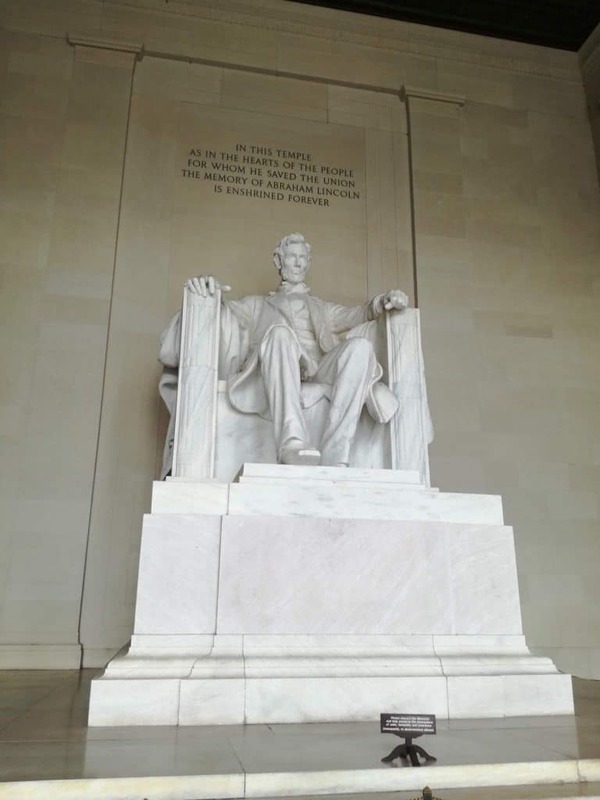 I even managed a very frugal trip to Washington D.C. It was a really cool trip that was very cheap. I also did some shopping while I was in the U.S. I was a bit disappointed by the prices. Indeed, I was thinking there was more difference between Switzerland and the U.S. But at the current price of the dollar, there is not so much difference. I bought a few small tools at home depot, for about 10% cheaper than what I would have paid in Switzerland. I also bought some clothes for me and Mrs. The Poor Swiss in Target and Ross, for something like a 20% discount. I also wanted to check if I could get some cheap used books. But it turned out to be much more expensive than it is in my favorite used bookshop, Emmaüs. In Emmaüs, I can get plenty of books for about 1 CHF. In the U.S. I did not find anything under 2 CHF and several books were more than 3 or 4 CHF. However, I may not have been to the cheapest bookshop. I remember a much better one in Berkeley years ago. Next time, I go to the U.S., I will see if I can find a cheaper one. September 2018 was definitely too expensive. We spent more than 6000 CHF this month. As said before, the biggest expenses are the plane tickets and the car repairs. And this month, we had to pay the quarterly bill for the power. This is about 250 CHF that goes out as well. But we had other unexpected expenses. We bought things for Chinese acquaintances. They will reimburse later. But for now, that is still 200 CHF out of the budget. And we had to replace our coffee machine. Transportation: 917.30 CHF: Much higher than average. This is mainly because of the 800 CHF car repair. Personal: 2254.09 CHF: Above average. Because of the plane tickets. Food: 204.15 CHF: Below average. We have been able to use a lot from the garden and freezer. And I spent 10 days in the United States with almost everything paid. Apartment: 1496 CHF: Above average because of the power bill. Not a lot things changed in the status of my goals. 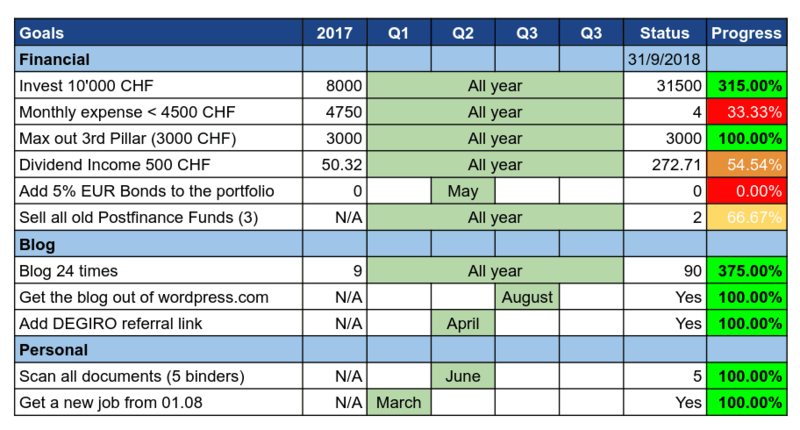 I was able to invest 5000 CHF more in September 2018. Unfortunately, the monthly expenses were much higher than 4500 CHF, breaking that goal once more. Next month, we should be able to stay below 4500 CHF. But we will see. I got some more dividends this month. And some of my funds will be paying next week. I am finally getting closer to my goal. However, I do not think I will keep this goal next year. I blogged about dividends in details. I mentioned in the article that there are some issues with dividend investing, especially in Switzerland. Doing some more research about this makes me think that it is not as interesting as I thought. Therefore, it makes less sense to focus on the dividends that I receive. Of course, it is still nice to receive dividends. But it should not be one of my focus. Our net worth just went over 120K for the first time :) We now sit at 120’770.40 CHF. This is starting to look good :) The gains are entirely through the addition of money into our accounts. The stock market has a return of 200 CHF for us the entire year. I would have liked having some stock market returns to help me. But maybe next year. I saw a great increase in users last month, almost 40%. Unfortunately, this did not continue this month as much. But there is still an increase of about 10% of users. Considering I did not do anything really special regarding audience in September, this is not too bad. I managed to keep my schedule of three posts per week this month. I actually did manage to write a lot in the U.S. Since my work computer is actually completely locked down, I could not play. I could not even access my RSS reader. The only thing I could do was write blog posts. I could also watch television but American television is really bad. There are just too many ads to watch a movie correctly. I did a few things to improve the blog again. I saved some vertical space so that people can see important things directly. Also, I tried to improve a bit the sidebar. It is still not perfect, but I believe it is getting better. I also improved a few things on the performance side. But this should barely be noticeable if you have a good connection. I still have a few things to do on my list that should be done next month. I hope this will improve the experience of the users on the website. Next month will see the one year anniversary of the blog! I am going to review this blog in details. I am going to talk about what went well and what did not. And you will see the detailed numbers about how the blog is going. I hope you will find this interesting. Dividends – Nice passive income. It seems that dividends are still a hot topic! How to buy an ETF (VT) on DEGIRO: A useful post that seems to be getting some new traction. 5 Ways to invest in Real Estate: It seems that real estate is also quite popular! Do you agree with this list? Which post did you prefer this month? What about you? How was September 2018 for you? Do you have any advice for us? Your numbers are quite good and that with the car was unlucky. But I assume this will not happen again in the near future ;-). Yeah that was unlucky. I’m hoping this won’t happen again, but who knows. Wow, 45% average is really good! Congratulations and good luck for your bonus. This month, we are hoping for 50% savings rate! We’ll see if that goes well or not.